Eurostat yesterday released its latest inflation statistics and the data for the eurozone provides some food for thought. Inflation reached its lowest levels (1.1% on an annual basis) since February 2010. This might seem surprising on the surface given all the talk of a eurozone recovery and a turn around. Why hasn’t inflation followed? Well, generally inflation is a lagging indicator and therefore any recovery will take some time to feed through to prices and wages. However, as the graph below suggests, there is more at work here. 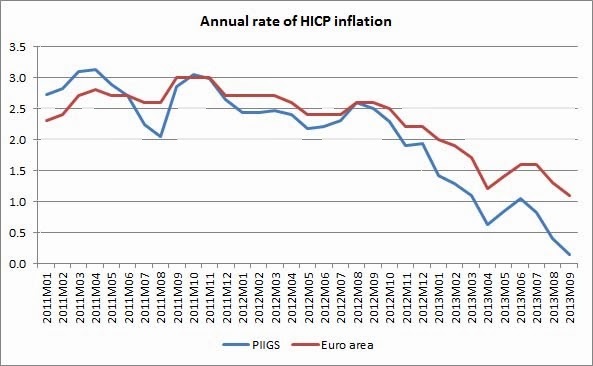 There has been significant disinflation (falling inflation but not negative inflation, which is deflation) in the eurozone and more importantly in the PIIGS. For all the talk of internal devaluation in the eurozone it has taken some time to feed through to the Consumer Price Index (CPI). Due to factors such as indirect tax increases and sticky prices and wages, it has taken some time for the impact to be fully felt – now that this is beginning to happen it is unlikely to stop immediately and could carry on for some time. 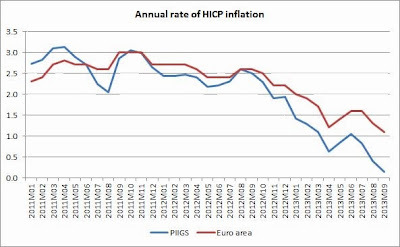 The data also shows that because of the effect described above, inflation in the PIIGS is diverging from the rest of the eurozone somewhat and particularly from the stronger countries in the north. What does this mean for the ECB? The FT has a couple of pieces today discussing this, calling on the ECB to do more to tackle the disinflation in the eurozone. While inflation is clearly well below the ECB’s target, the current nature of the inflation does present some issues for ECB policy. Firstly, there is the standard one size fits all conundrum – as inflation plummets in the PIIGS it remains stable in the north and threatens to increase as these countries post higher levels of growth. Adjusting the policies to suit these countries more could prompt unwanted outcomes in the stronger countries. Politically, it’s also worth remembers just how wary Germans are of inflation, as we highlighted recently. Finding the correct line between these two camps is incredibly tricky for the ECB. Secondly, while the struggling eurozone countries could use a boost in demand, the ECB may struggle to find the necessary targeted approach to do this. One measure which has been widely mooted is another long term refinancing operation (LTRO) to help boost liquidity in the market. However, as the graph above shows, there was no boost in inflation from the previous rounds, despite it totalling around €1 trillion. This is largely because the money did not filter through to the real economy and therefore did not impact consumer price inflation. Although things are improving there is still plenty of fragmentation in the market and loans to the real economy continue to fall in the PIIGS. This point also applies more generally in our view in terms of the tools at the ECB’s disposal. As we discussed at length here, although the ECB can do much to stop the break-up of the euro, it has fewer tools to help promote economic growth in the current circumstances, particularly in specific economies. In our view disinflation is not such a risk for many of these countries, in fact many need to see reductions in prices and wages to help boost their competitiveness, although it does of course have knock on impacts for their already flagging GDP growth. That said, deflation is a bigger risk because these countries have such large debt to GDP levels, which would only be exacerbated by deflation – although for countries such as Greece the need for further debt relief is already very apparent so the marginal impact of deflation is smaller. All in all then, low inflation in the eurozone seems here to stay for some time due to the periphery pulling the average down, even if a fuller recovery eventually materialises. This will create some new issues for the ECB to deal with, however, given the divergence between countries it may well struggle to find the tools to have a big impact on this. I think you could add that the periphery doesn't only need "reductions in prices and wages to help boost their competitiveness"
They also need fundamental economic reforms, more flexible labour markets, improved post-secondary education, reduced Government ownership of the economy, and public sectors reduced in size. I don't see current eurozone policies helping with any of that. Current policies for the periphery are focused on a small set of financial metrics, and not on fundamental reforms of the real economy. People talk about the eurozone as if it's something radical and new. It isn't. Before the Great War Europe had free trade, free movement of labour and a common currency in the shape of the Gold Standard. It didn't help. The core countries got richer and the periphery stagnated. The eurozone is to a large extent simply missing the point. Financial problems are just symptoms of underlying economic problems. Tinbergen already said it probably half a century ago if you want to influence the economy you need a simple case. With measures you should only try (and are able to) influence one thing. Try to influence more things and it gets a mess. Next to the differences between the different countries. And these 3 bite each other. Competitiveness is a worldwide issue (not an internal EZ one). It simply does hardly matter to whom you export. From there you donot want measures that makes the things you make more expensive (which inflation basically does). Deflate (effectively) yourself into competitiveness simply doesnot go together with measures that increase inflation, like lower rates. However at the same time you need lower rates to kick start lending, borrowing and investment. This simply bites as well with inflation. If things bite each other you have to prioritise. But the standard policies have in a situation with unbalances galore limited effect. Overall that is reduce one unbalance by creating a new one (or a larger one) elsewhere is hardly helpful. As said priority setting as far as the standard stuff goes. Combined possibly with structural measures for the rest of the things. Especially seen the fact that this crisis looks mainly structural and not cyclical this could work. However is a tough political sell. And find a way to make it possible to uncouple countries as far as certain policies go. From a pure economic pov hardly helpful if you have solved the problems in the South (wishful thinking) and created all sort of new unbalances (RE prices, pensionfunding) in the North as a consequence of the measures taken. And from a political pov messing up things up North to save the South will erode the platform in the North even faster than it already does at the moment. And we are pretty close to that already tbh. Germany has the advantage that its strong industrial base obscures things for the electorate. But in Finland and Holland it will be a very hard sell if say Sweden, Danemark and the UK get back to some growth and they not. As it is pretty obvious that the EZ and its problems will be a major cause of that. If such a disparity becomes structural (as it looks it will be) you have a problem at hand. Deceptive to talk of Eurozone inflation or growth. Some parts are in deflation, other parts inflating; some parts are in recession and others growing. It is not an entity but a collection of highly divergent states.